Ha! Sometimes even more than really pretty food photos I like ones where the food does not look very appetizing. It just makes me laugh. This photo has me giggling as I'm typing because it totally looks like a turd. Ivan kept asking me to make some kind of granola type bar and I somehow stumbled across this recipe on Foodie with Family for Homemade Larabars. I had never tried a Larabar but the recipe sounded good so I tried it out. Sooooo good. I'm not going to repost the recipe but I will mention the modifictions I made. Make sure you check out the original recipe so you know what I'm talking about. 1. Instead of using just almonds I mixed up about 1 cup of almonds with 1 cup of walnuts+cashews. One time I used peanuts and almonds because I was short on nuts. All variations were equally delicous. 2. I don't currently have a food processor so I used my Magic Bullet (greatest thing ever) which is much smaller. I ground the nuts in batches and put them into a big bowl after they were beat to a pulp by the bullet. Then I ground the chocolate chips in batches and added them to the nuts in the bowl. Are you getting the idea? 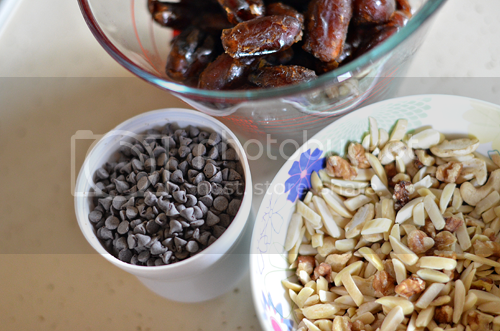 Just in case you're not...then I processed the dates in the bullet in batches and added them to the bowl too. I mixed the nuts, chocolate and dates with a wooden spoon and then added all the peanut butter at the end. Obviously a food processor is much easier but these aren't too tough to make without one. They are seriously yummy and I want to try making a coconut version soon. Let me know if you try these out! They look wonderful! I'm always disappointed when recipes call for nuts(can't have those right now), but it suddenly occurs to me that I could use some oats instead:D The coconut sounds delicious too. mmMMMmmmmm turd bars, you really know how to whet one's appetite! hahah. I admire you're patience to keep doing 'bullet batches'...it must be a good recipe if you're willing to go to all that work! Yum... now I think i'm going to have to go make these! I love raw food (as you know). And I love Larabars too (I buy boxes and boxes on deep discount). I love to make these sorts of things for the family- mine usually end up in the form of balls instead of bars. I'm going to try this recipe for sure. Thanks for sharing! Your turds look great! oh yummy, this looks really good. it has chocolate in it so i might even be able to get my 4 year old to eat it. haha. thanks for the recipe! Hehe! You are so awesome. Oh these look super yummy. So going to try these out. AND there's chocolate in them? Well shut the front door. I just had Larabars recently. They are very good. I will have to try this recipe. Haven't tried to make anything like this yet. Deeelish! I'm mostly raw vegan so my fave desserts and treat-ish snacks are some combination of nuts, dates, and flavoring! Yummm! !